"And everybody is born with mutations. This person just happened to roll snake eyes," said the geneticist who examined this strange skeleton. The Atacama skeleton, named after the Chilean desert where the remains were found, has 10 pairs of ribs. The Atacama skeleton, or Ata, named after the Chilean desert where the remains were found, has 10 pairs of ribs. The average person has 12. Ata's skull narrows to a ridged peak. Her bones are as calcified as those of a child between the ages of 6 and 8. Yet her skeleton's apparent age is at odds with her size. If Ata ever stood, she stood 6 inches high, barely tall enough to peek over a spring crocus. Her features attracted UFO hunters and extraterrestrial investigators, who suspected her bones might represent something remarkable. Ata is indeed remarkable. And she is human, according to the story told by her genes, which was published Thursday in the journal Genome Research. "We were able to look at all the mutations that were in this individual," said Stanford University geneticist Garry Nolan, an author of the new report. "And everybody is born with mutations. This person just happened to roll snake eyes." In 2013, Nolan revealed what he called a draft of her genome, which, though it had gaps, confirmed that Ata had human DNA. The new work presents her whole genome, including her unusual mutations. Ata's story started in northern Chile, one of the world's driest regions. The Atacama links Earth to the heavens. On its high plateau, NASA tests Mars rovers, driving them across parched terrain that role-plays as the Red Planet. The sky rarely musters a cloud, giving a horde of giant telescopes an unblemished view of the stars at night. The desert is the future home of the world's largest optical telescope, named the European Extremely Large Telescope, and where construction began last year. And it was in this desert, near a church in an abandoned village, where a man reportedly found Ata's remains in 2003. The collector who now owns the skeleton purchased Ata from an archaeological black market, Nolan said. Ata's skeleton is kept in a secure location in Spain, according to Steven Greer, a retired emergency room physician who advocates for government disclosure of UFO sightings. Greer first met Ata's owner at a Spanish ufology conference in 2009. (People who study UFOs use the term ufology to make their pursuits sound more scientific.) The collector, after some persuading, allowed Greer to extract a small pip of bone marrow from one of her ribs. When Greer held Ata, he marveled at her size: She is so small her skeleton fit in the palm of his hand, he said. In 2013, Greer co-produced a documentary, "Sirius," which unveiled Nolan's initial genetic research. Nolan was not alone in his investigation. The Stanford scientist enlisted experts from a variety of fields, including specialists who study ancient DNA. Ata, though desiccated by the super-dry Atacama, is no ancient mummy. Over centuries, DNA breaks into fragments. But the genetic material in her body is too complete to be older than a few decades, he said. Nolan tapped Ralph Lachman, a pediatric radiologist at Stanford's Lucile Packard Children's Hospital, to analyze the skeleton's X-rays. The physician, Nolan said, is the "world's expert in bone disorders." Based on features such as growth around the bones' knuckles, the skeleton appears to be as developed as that of a 6-year-old's. But, to be clear, Lachman never argued Ata died in the midst of childhood, Nolan said. "He said the bones make it look like it's 6 years old," Nolan said. Comparing Ata's genome to the genomes of a chimpanzee and monkey ruled out a nonhuman origin. Her ancestors were South American, and most possibly Chilean. The scientists found no suggestion of a Y chromosome in her genetic package, confirming that she was female. The new study uses a giant database of what Nolan called "phenotype-genetic correlations." An individual's phenotype is the collection of his or her characteristics, including height, eye color and earwax wetness. Genes, as well as the environment, influence a phenotype. Of her billions of nucleotides, which are the single bricks that make up her genes, the authors identified 3 million variations. This massive database is similar in concept to a social network mined by a research firm, Nolan said. If Cambridge Analytica collects enough of your likes and dislikes, it can predict your political preferences. Likewise, with enough genes, researchers can predict which individuals will have similar phenotypes. In many cases, Ata's genes matched individuals with bone disorders. She did not have an unusual number of mutations, Nolan said. What was exceptional was where they were concentrated. "This is a super rare human phenotype," said co-author Sanchita Bhattacharya, a bioinformatics researcher at the University of California at San Francisco. Ata is one of the rarest "we have ever observed, being only 6 inches and having this advanced bone age." USCF biomedicine professor Atul Butte, who created the database, said Ata had 64 unusual mutations linked to the skeletal system. Among these, the scientists found two variants new to the scientific literature that code for an abundant structural protein called collagen, as important to our bones as steel to a skyscraper. All told, the story in her genes is tragic. 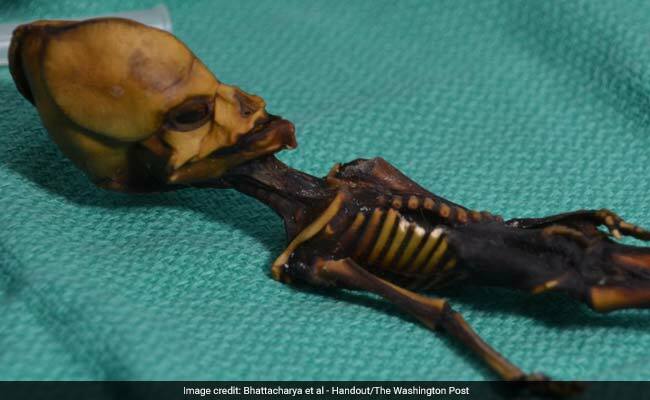 "Given multiple mutations identified in this specimen one could speculate it didn't survive long," Bhattacharya said, even if she was born alive. Given her origin, one could imagine, Nolan said, a distraught mother bringing her infant to a priest. "It was found, supposedly, in a house next to a church, which to me says rectory," he said. The body was positioned as if lying in state, arms to the side. "And then time goes by," he speculated, "and it gets forgotten or the priest dies." Nolan said he does not blame the owner for wanting to study Ata. After all, it took a team of 10 scientists five years to figure out what she is. Nor did he regret his study, and his investment of what he estimated to be $50,000 in funds and a quarter-million dollars' worth of time. "Now we know that there's something about this particular set of genes that leads to rapid bone growth," he said. He envisioned using this knowledge to influence stem cells and cartilage, healing bones quicker, and correctly. "To me, that's the beauty of basic science," he said. But, Nolan said, he hopes Ata's story ends in the place where it started: "Maybe this thing needs to be returned to Chile. Maybe it needs to be given the burial it deserves."